RES have supplied additional documentation for their proposal. Some of the files are very large, Chapter 7 (figures part 1) is 28mb and part 2 is 127mb! The rest are quite manageable though. If you would like the 2 large files supplied please let us know and we’ll either put them in a drop box or send you a disc. To see the full list of the files please click here. A Pubic Local Inquiry is to be held to examine all the evidence surrounding this application. Save Straiton for Scotland has been asked to co-ordinate speakers and witnesses from the local communities and from Crosshill, Straiton & Kirkmichael Community Council. The Reporter, Trevor Croft BSc DipTRP ARSGS FRSA MRTP, has afforded SSfS the same status as other statutory consultees such as East Ayrshire Council and all documentation will be made available to us. We are currently researching, writing and planning our structured objection to the issues we feel are the most important to residents and the local communities. The Inquiry will take place in Patna from Monday 28th September to Friday 9th October 2015. Keirs Hill (formerly Sclenteuch) wind farm was submitted to the ECDU by RES UK and Ireland on the 29th November 2013. Planning documents can be found here. The final date for representations was the 24th January 2014. The links below are the submissions from SSfS and VisitStraiton. There is also a landscape review provided by consultant Mark Steele. There is a dedicated website that is scheduled to go live following the public exhibitions so keep checking this link for updates. RES have reduced the number of turbines from 33 to 17 and removed all turbines from Cloncaird Moor, Sclenteuch Moor and Lamdoughty Hill. The new proposed development will concentrate around Keirs Hill in East Ayrshire. 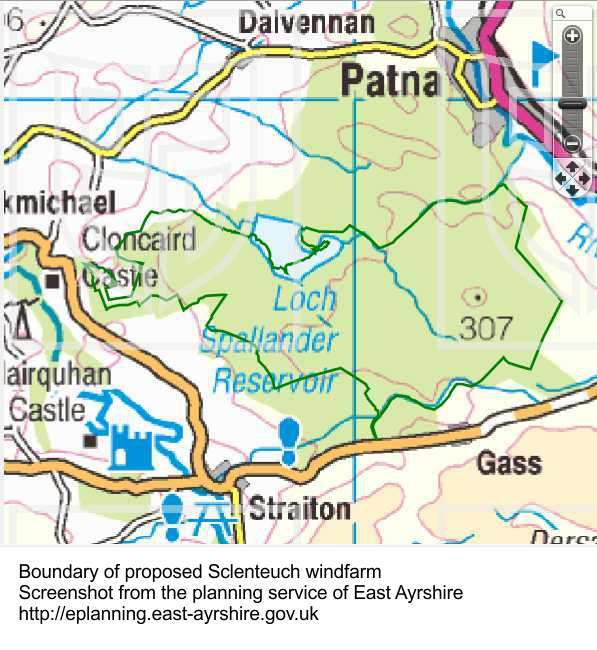 No turbines are being proposed within the South Ayrshire footprint. The wind farm has been renamed Keirs Hill and will lie 3.7 km north east of Straiton, 4.2 km north west of Dalmellington and 1km south of Patna. Access to the new proposed development will be via the A713 , Ayr to Dalmellington road and will enter the proposed site just before Waterside. The proposed turbines will be 149m high. RES will be looking to formally submit a planning application during 2013. This document contains the responses of statutory consultees (SNH, Historic Scotland, etc.) to the initial proposals by the developers. The responses, some of which are more interesting than others, begin on page 38 with the response of South Ayrshire planning. I have not had time to read this document in detail yet. When anyone has had the chance, please comment or contact me. The following is from the Sclenteuch Scoping document: “The proposed windfarm is for [a] … development at either 126.5m or 146.5m to blade tip. The 126.5m to blade tip option would require clear felling of the forested site and the 146.5m to blade tip would require ‘key hole’ felling. These two options have very different potential landscape and visual impacts.” The revised (Keirs Hill) plan involves even higher turbines at 149m and, we believe, that the plan involves clear-felling (RES say that the trees would be clear-felled in the near future anyway). Replanting would take place so that only a small percentage of forestry would be lost in the long term. It is interesting to note that the turbines are to be placed at the 280m contour (i.e 280m above sea level). If 149m turbines were placed at this contour, the total height of the turbines would be 429m above sea level. This is over 100m higher than monument hill at Straiton, where the monument to Colonel Hunter Blair sits just above the 325m contour.